I decided to let her be queen for a day! Don’t you think she looks dignified? Or maybe I have dignified mixed up with annoyed. At least she looks better with the crown more centered. Maybe not anymore regal. It looks like the whapping paw is starting to come out. I had better make myself scarce. As long as she doesn’t look over here, I am safe! What a queen that Binga makes! But quick, have your human get her some cream before she gets unruly! Tee hee hee! Winky winks. Binga has the ability to look EPICALLY annoyed that’s for sure but somehow adorable at the same time! That red queen putfit looks good on Binga. 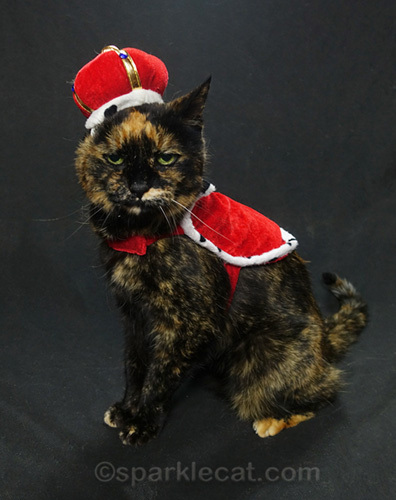 She sure didn’t look like she felt very queenly though, MOL! 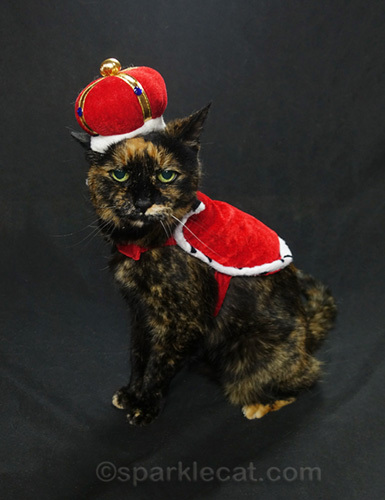 Binga makes a great-looking queen. But don’t tell her we said that. We don’t want to get whapped! Whoa! Photographer down! Score one for the tortie. Actually, the Royal crown SUITS Binga! She looks furry regal! That is one mean look in the last picture, Summer! She didn’t look very happy, but I liked your laughing face. I showed on Twitter, a picture of my Sydney sitting on the shelf, in her Queen Pose. Oh Binga, you were Queen for a day. Even though you didn’t look happy. At least now you know what Summer has to do every day.We did enjoy seeing you. 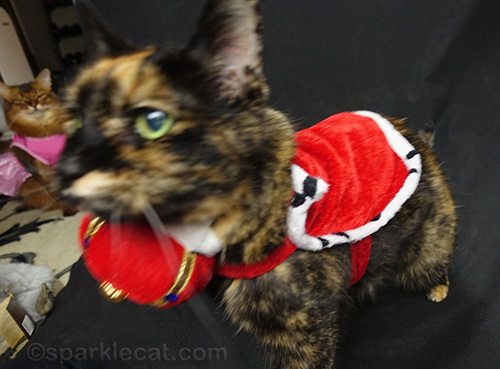 even with how great she looks in it, it’s clear binga prefers to be crownless. 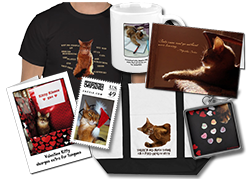 Binga has the purrfect look of disdain! And the red really plays off of her fur colors well! The 3rd photo should be on a greeting card or something! OH dear me Binga I must agree with Summer that does look like a huge pin cushion. Oh my! Binga does not look like a happy kitty. MOL! Yes, we definitely think you confused dignified with annoyed, Summer! Your expression in that last photo is priceless! Binga, you look so Royal that I am in awe. I think Summer’s comment about a pin cushion over the ear was funny though, even if it wasn’t about how royal you were! It sure got mom laughing! But that picture of you two at the end with Summer in the background…if Summer isn’t hee hawing with laughter I don’t know who is! Better get that whapping paw back out. Binga is such a beautiful queen! She looks majestic! We love the Royal you sweet Binga! How funny! Yes, Binga does annoyed queen very well. Binga look absolutely fabulous as queen She has all it takes! Watch out for dat smacky paw! 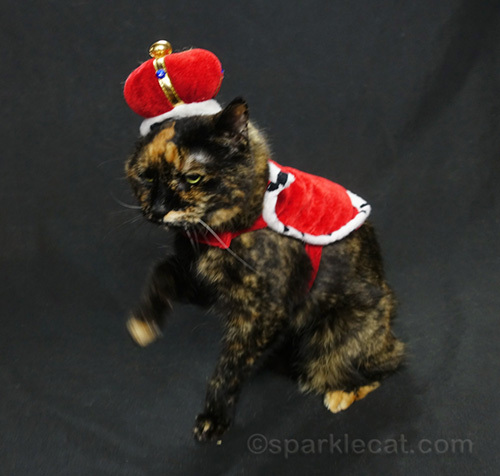 Binga makes a great queen! Hope she enjoyed her short reign and got extra treats at least.